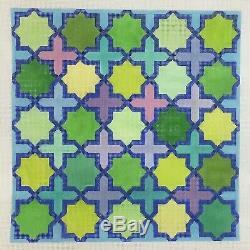 Kate Dickerson Hand painted Needlepoint Canvas Moroccan Tiles blue grout green. Stitch painted by hand on 13 count canvas 14? The Nimble Needle is a brick and mortar needlework shop. All merchandise is brand new from current inventory and not from a private stash. When purchasing multiple items, add all items to your cart first. The item "Kate Dickerson Hand painted Needlepoint Canvas Moroccan Tiles blue grout green" is in sale since Thursday, January 31, 2019. This item is in the category "Crafts\Needlecrafts & Yarn\Other Needlecraft Supplies". The seller is "nimbleneedle1" and is located in Merchantville, New Jersey. This item can be shipped worldwide.